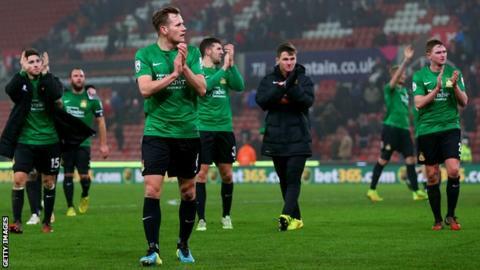 Wrexham manager Kevin Wilkin praised his players after they came within 10 minutes of causing a big FA Cup upset. The Conference side led the third-round tie through Mark Carrington's header. But Marko Arnautovic equalised in the 80th minute for the Premier League hosts, who went on to win it with two late Stephen Ireland goals. "The players were tremendous from start to finish and obviously we're disappointed not to at least have earned a replay," Wilkin said. "We've given them a real scare, scored with 15 minutes to go... to take them as close as we did I'm very proud of the players. "Hopefully everybody that's come there and got behind us has had an enjoyable day... it was a terrific cup tie. "The game plan worked a treat by and large and it's just a little bit disappointed that we haven't at least taken Stoke back to the Racecourse for a replay." Despite the disappointment of coming away from the Britannia Stadium empty handed, Wilkin hopes the experience can help them triumph in next Saturday's FA Trophy game at Stockport and then kick on in the league. "Those players have showed what good players they can be and it's finding that consistency week in week out in the league that we now need to do," Wolkin added. "But they proved on the stage today they're more than able to deal with that situation and we now need to focus on the FA Trophy next Saturday, and focus on our league form." Stoke boss Mark Hughes, the former Wales manager who used to watch Wrexham as a boy, admitted he had been a worried man when the Dragons took the lead. ""At that point I thought we were going out to be perfectly honest," Hughes said. "Wrexham were good value and we hadn't produced anything of real note. It didn't really look like we were going to either. "But thankfully we had made a couple of changes and that helped us. I didn't really want to involve Peter Crouch or Jonathan Walters today, but we needed their understanding of what was required. "We were able to get back level quickly, which was important, and then Stephen Ireland comes on and produces that craft I talk about time and time again. "The score isn't a fair reflection of the game and is fairly hard on Wrexham, but in the end we are delighted we are through. "Credit to Wrexham - they had a good shape about them and a game plan."